By Brittany Lamas Valerie Do, a history major at the University of Texas at Austin, bought her first bicycle two years ago and was looking to learn more about it. That listing was for the Orange Bike Project, which collects donated bicycles and parts for a semester or daily rental program for students. Founded in 2008, the project offers a green, low cost way for students to commute around campus. All of the bikes are acquired from donation and kept in the “Cage” in the Guadalupe Garage, at the corner of 16th Street and Guadalupe, where the project is housed. Most of the bikes need some sort of repairs before they can be rented out. “Usually there’s a reason they are donated, but every once in awhile we get a gem,” Do says. Do, whose job is to fix up the bikes, works with student director Victor Harris. They are the group’s only paid employees. Students looking to rent a bike must be added to the wait list, which currently has more than 250 students on it. Harris says a student can wait an entire semester or longer for a bicycle because of lack of inventory to fill demand. Of the 120 bikes currently in the fleet, only 70-80 are available to be rented. “The reason it takes too long is we have to fix up the bikes that we get and the ones that we already have,” Harris says. 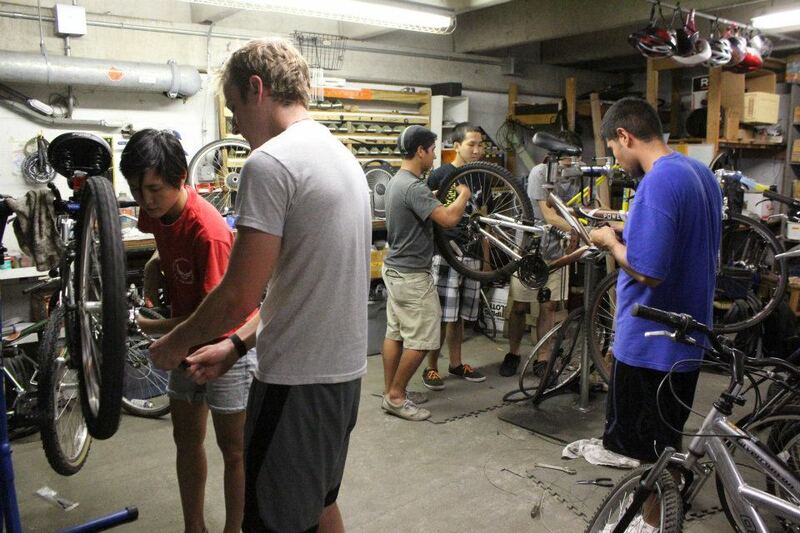 Students can gain priority status by either volunteering to fix bicycles or their time in the group’s office. Saving money was important in her choice of renting: “Buying a bike is at least $100 whereas you could come here and rent one for $20 for the whole semester. It’s a great alternative.”. A recent merger between Parking and Transportation Services has made OBP operations easier, Harris says. Formally a part of the Campus Environmental Center, the merger with PTS cuts out some of the processes the group had to go through before. A major mission of the project involves making the University more environmentally friendly. A recipient from the Green Fee initiative, the group received funding from the committee to put toward making the campus more eco-friendly. OBP bought 12 brand new bikes with the Green Fee money and students can rent those bikes for a day, two days, or a weekend long basis. The shorter rental program has its own, separate wait list. The Green Fee funds come from $5 of every student’s tuition. It began in Fall 2011 and runs until Summer 2016. Along with maintaining the ability for funding through Green Fee, Harris says the group is also working to obtain a satisfactory ranking from the League of American Bicyclists’ Bike Friendly University program. The program evaluates schools based on engineering, encouragement, education, enforcement and evaluation/planning with goal of spreading sustainable campuses, according to its website. “One top tier university is Stanford,” Harris says. “They have the highest ranking. Right now we got an honorable mention so we’re not even ranked.” Harris says they plan to keep working and growing to eventually get ranked. Chen says more students should know about OBP because it’s a great alternative to vehicles and good for the environment.